More often than not, drug or alcohol users have a difficult time recognizing that they have a problem. Whether they choose to ignore the warning signs or are afraid that they aren’t powerful enough to rehabilitate, they often refuse treatment. That’s when families must call for an intervention and organize a meeting between them, the patient, and a professional. Marriage and family therapy is often an integral part of the recovery process for those struggling with addiction. Marriage and family therapy is an essential factor that contributes to the rehabilitation process. Having this kind of support represents a huge benefit for those struggling with addiction. Instead of focusing solely on the individual, this type of therapy regards the family as a unit and engages every member in the process. The target is to strengthen the relationships between the family members and help them understand and forgive each other. 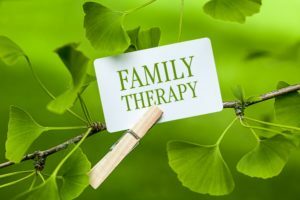 The mediator of these marriage and family therapy sessions is often a therapist (MFT), a mental health practitioner with additional training regarding family systems. That allows him to treat emotional and behavioral problems within a family and offer a set of solutions suitable for them. Their approach is holistic, the focus being the long-term balance and content of the family. Many studies are still in progress regarding family and marriage therapy as part of the recovery process, but the results are promising. One research published in the Journal of Marital and Family Therapy showed that no matter the family type, marriage and family therapy can increase the adherence to treatment and significantly reduce the chances of a relapse. Also, the results demonstrate that family therapy can also treat behavior problems easier and correct the triggers of addiction. As a result, the healing process is shorter and lasts for longer than if the patient would not have opted for family therapy. However, no study can say exactly for how long or often one should go to therapy to achieve the best results. The frequency and duration of the sessions depend on the patient and their situation, as the primary task of family therapy is to solve problems and connect people. What Happens During a Marriage and Family Therapy Session? At the beginning of any family therapy treatment, the therapist will first want to observe the interactions between members and see how they relate to the problem. At the end of these initial sessions, he will be able to identify how the drug addiction affected the mental health of the family and their relationship. Then, the therapist will consider the personality of each sibling to conceive a suitable therapy plan and improve the way members relate and communicate with each other. After the counselor explains the basic rules, objectives, and principles of the therapy, the following sessions will focus on finding ways of improving communication, finding power structures and discussing the consequence of the substance abuse. Towards the end, the frequency of the therapy sessions will decrease, and the specialist will present his review of the family problems and the progress made. At the end of therapy, the family should have healthy coping mechanisms and a better understanding of each other. Family and marital therapy alone is usually not enough to overcome an addiction. Regardless, this is still an important tool in someone’s recovery process leading to substantial progress in long-term rehabilitation. Despite the fact that drug abuse is difficult to treat, alternative therapies, such as outdoor treatment programs or psychological counseling improve the chances of success. Supporting a loved one during their treatment is an essential part of recovery and learning how to overcome the consequences of addiction is an empowering factor. It is possible that health insurance will cover marriage and family therapy. However, it mostly depends on the company and their policies. Patients have to contact the company and specifically ask if their plan includes mental health insurance as well. It is also important to determine if the therapist works with your insurance company. Sometimes patients have to pay the bill at the beginning of the treatment and get reimbursement from the health insurance company afterward. To achieve success with the recovery process, one must carefully select what types of integrative and complementary therapies would work for him. Many patients choose spiritual counseling to identify a philosophy that suits their lifestyle and beliefs, as a completion of the marriage and family therapy. Specific factors need to be taken into consideration when looking for a therapist or a suitable program, such as accreditation, clinical experience, and program features. We take the family’s role in a man’s addiction treatment very seriously at Windward Way. Addiction to drugs or alcohol frequently disrupts or destroys relationships with the people we care most about. Quite honestly, we see issues pertaining to relationships and substance abuse in the majority of cases we tackle in our addiction treatment program for men. Using both innovative and traditional addiction treatment methodologies, Windward Way’s counselors seek to restore the lines of communication between our clients and their families and spouses. The view from us is that addiction requires everyone to be on board (as is possible) to effectively carry out an alcohol or drug rehabilitation program. Our family program, in particular, is an especially effective medium through which to engage clients’ wives or husbands and their families. The family program not only helps all parties understand addiction from the disease model, but also begins to heal the deep wounds addiction has invariably brought. We strive within our holistic approach to addiction to convey sensitivity and compassion, and also confront the family issues that may have driven a wedge between the client and the people he cares about. It’s time to begin anew again. It’s time to heal. It’s time for Windward Way. We’re standing by 24/7 to answer any of the questions you may have to guide you through the process to long-term recovery. Call us now at 855-491-7694.